I still working on how to write for these posts as well digitizing verses and sentiments. I image I will just get things down to a comfortable rhythm and it will be time to change again! Ever notice how that works in life, both the natural and the spiritual. The car is finally all paid for and then the engine goes. We think we've arrived to being just about the most perfect person on the planet and then we look in the mirror. Those shifts also keep life very exciting -a lot of our balance in life depend on our perspective. That would make a good quote for a card wouldn't it? "A lot of our balance in life depend on our perspective"! When I close my eyes I see colors and paper patterns, now I'm thinking in quotes. I may need to get out more! I still plan to participate in fun things too, they help the creativity keep flowing! Today is what's on your Workdesk Wednesday - it has been a couple of months since I've joined alone! Hop over to Julia's blog for the world wide tour of craftyness! Stop over to Julia's when you have a few minutes to relax! 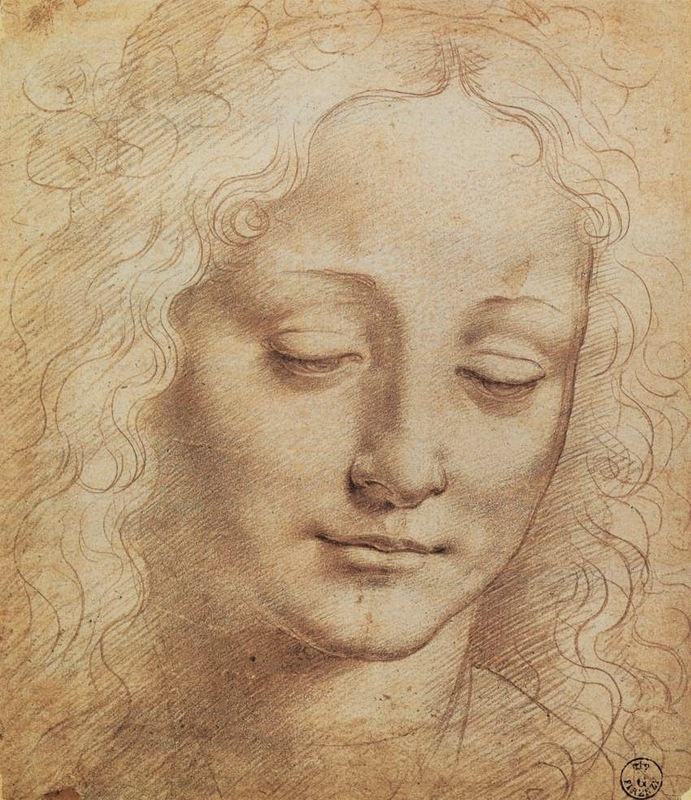 I teamed it up with a Da Vinci portrait we are familiar with. Both of these cards are 5x7 and I made the images in PE but you can also do this in Publisher and Word. 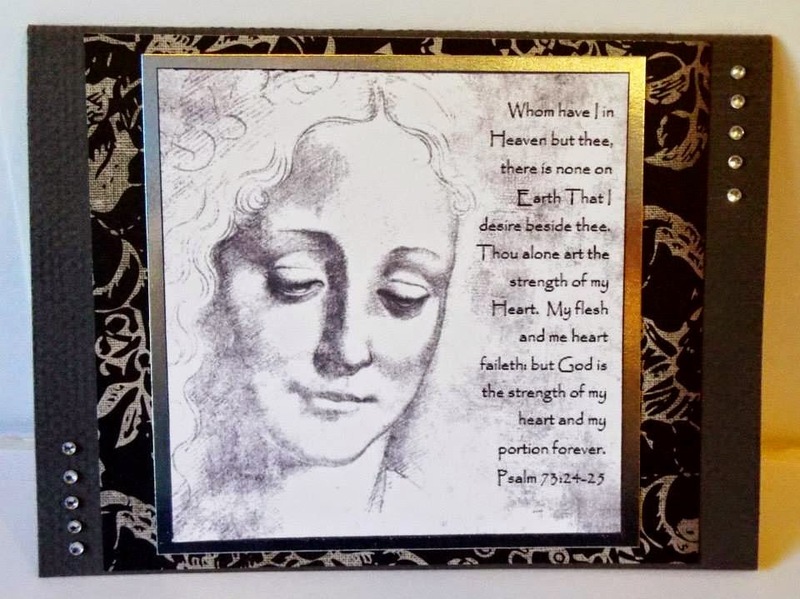 Such a beautiful Statement, "God the Strength of my day! Amen! ah Ginny adore the verse, esp done in papyrus. I like a script that is easily legible. 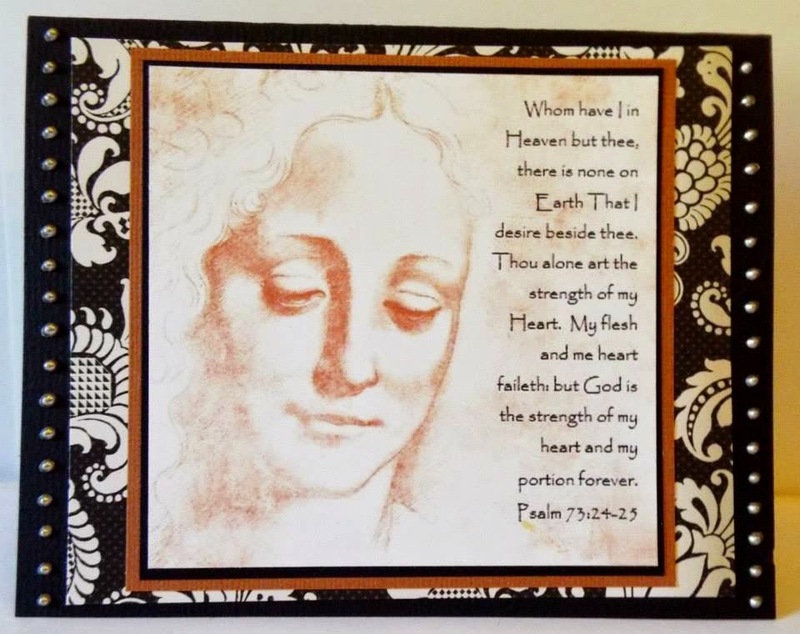 I love the way you combined the scripture with the artwork, very pretty. Like the shelves and storage for your pens. Just got a set of Spectrum Noir pens and will have to find a way to store them lying down. Like the new verse. It is so true. A great verse Ginny. One to remember when things are hard, when things are easy, all the time, really!! Hi Ginny, Sorry this is a late-in-the-week comment, but I try to visit as many desks as possible and it takes me ages! Thank you for witnessing. The verse is a good one. I have downloaded both PNG files. Thank you so much. The Davinci card is beautiful. Thanks for sharing. Thank you for letting me look over your shoulder. 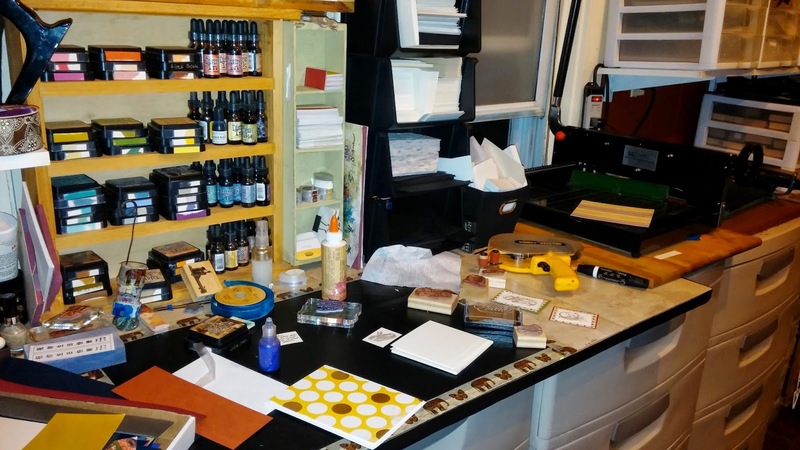 What a fun work space you have!! I love all your markers and pencils and inks! It just gets my creative juices flowing!! Thanks for stopping by this week! Glad to have you back on WOYWW! Beautiful cards, and you chose very nice fonts to go with. Thank you for visiting and your nice comment! 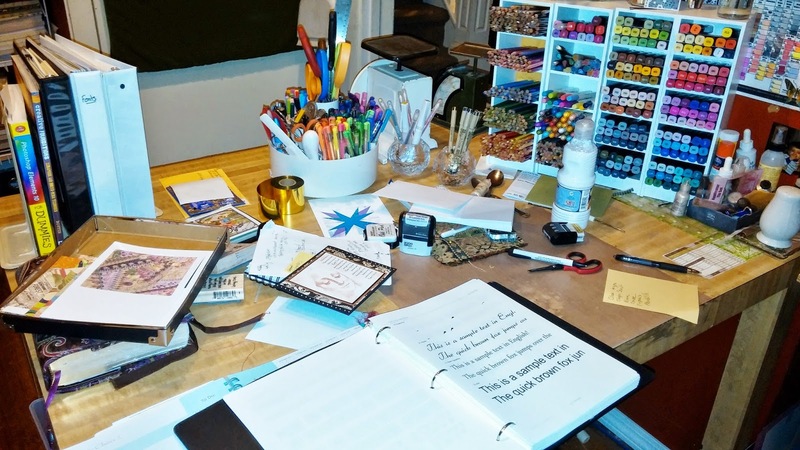 What a wonderful work space, and lovely cards, too, Ginny! Thanks for visiting. I know just what you mean, got that die cutter out and cutting in ernest, and showed everyone then the handle fell off! I will have to try and get the retailer to do something about it and I don't hear good things about them - didn't know before I bought it! Hi Ginny thanks for the visit, it's been one of those weeks for me and I am still trying to get round. Love your work space lots of room and great cards. What a wonderful workspace! love the cards you created. Thanks so much for stopping by. Hi Ginny, Loving the cards, verses and the quote. Adore the photo of the Peacock. Stunning. Your work space is fab. 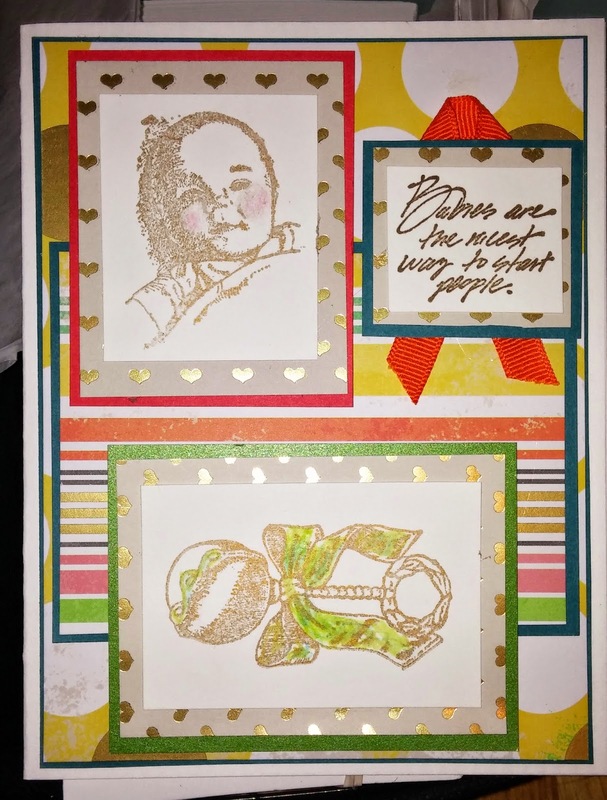 Love that quote and your baby card is really lovely. Thank you for the peek at your desk. Keeping a font book is a clever idea! Now why didn't I think of that? I write a newsletter for my brass band and I'm forever searching for the perfect font.......doh. I love that quote in Papyrus, clever you teaming it up with that Da Vinci drawing, it looks fab!